Hope and Ivy boho wedding gown. Features chiffon style fabric with two tired fluted bottom and embellished pearls and beads in a flower pattern. A high illusion neckline with an open keyhole back with soft short sleeves. Perfect for that bohemian bride or for a change into dress for the evening reception. David Fielden sample wedding dress No6. A truly stunning dress with exquisite embroidery crochet lace feature on the bodice and shoulders. This soft crepe dress is entirely feminine, demure and chic with its open v neckline and keyhole detail on the bust. The soft A-line shaped skirt will suit and compliment most figures providing ease of wear and movement on your special day. The back of the dress has two fine spaghetti straps coming from the crochet lace which also features as detailing on the low back and sides. David Fielden sample wedding dress No4. Delicate, beautiful French lace overlays this dress stunning dress, with a satin stone coloured underlay. The combination of these two layered fabrics gives this dress its wonderful unique appeal. The fine French lace is just beautifully adorned giving a bohemian and vintage feel. The bodice is sweetheart shaped with lace appliqued on the fine spaghetti straps for a stunning detail. This lace features on the low back of the dress giving an illusion detail that best shows off this exquisite fabric. David Fielden two piece ivory sample wedding outfit No3. We adore this stunning two piece bridal dress for its elegance and luster rich satin fabric. Styled in a soft wide cowl shape with a unique twist drape from one shoulder. The top has embroidered lace applique detailing to the hem and the back is fully covered with a side concealed zip. The skirt has the same matching embroidered applique detailing at the bottom. The skirt fits in at the hip with a slight fishtail back where the applique lace is detailed further up defining a small spill or puddle like train. A simply beautiful wedding look for those wanting something a little different. David Fielden ivory sample wedding dress No 2. 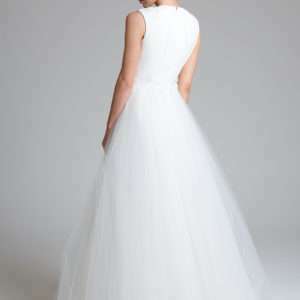 Beautiful full skirt style sample wedding dress that’s both modestly elegant and feminine. Featuring a soft tulle full ball skirt for that princess royal feel. The crepe bodice has a pleated front with intricate hand beaded pearls on the waist and shoulders too. The pleated effect is on the back of the bodice with a concealed zip giving you full back coverage. David Fielden ivory sample wedding dress No 1. Stunning ivory satin gown featuring a fine tulle overlay on the top half of the dress, embellished in a floral champagne coloured applique detailing. The dress has a high front neckline with cut-away shoulder halter style. The back of the dress features a continuation of the applique champagne flowers and a low v-back detail with fine spaghetti straps. A truly contemporary design with the soft feminine feel for that special day.